When she began her family, Sharon felt as though she was thrown into the deep end of the pool. She put all her energy into surviving motherhood. Two children later, Sharon came up for air and realized she wasn’t who she once was…and she missed herself. Sharon began her search for insight and understanding. After gaining a new way of approaching motherhood and feeling a sense of restored self, Sharon wondered if others could benefit from her findings. As a result of this process, she wrote Rediscovering the Person You Lost: A Workbook for You and developed several workshops and seminars specifically for moms. Sharon doesn’t claim expertise on motherhood, but rather provides a method to help mothers gain understanding and insight. Don't Just Survive Motherhood – Live It! Children change you. There is no doubt. And that’s good. But what happens when emotions of guilt and stress creep in and rob you of joy? Based on the philosophy that women don’t need to lose themselves in the process of becoming a mom, Sharon speaks from real motherhood experience. Life moves quickly, which is why it is so important to take some time for you. Reflect on yourself and reconnect with who you are and what is important to you. And in the process….become a better mom! Learn balance, self-worth, how to deal with guilt and other life skills. Skills that will help you not just survive motherhood, but love it! Self-Talk: What are you saying to yourself? Time for yourself is not indulgent – it is a need. "Let me introduce you to yourself." Designed with the busy mom in mind, this invaluable book of exercises helps you turn ideas into useful tools. Take some time to explore your individual strengths and renew a commitment to yourself. 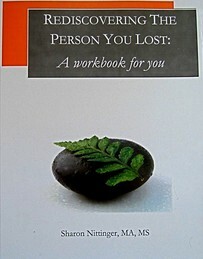 This workbook was created to help you be you again….only better. You can meet yourself and spend some time with your thoughts in a directive and productive manner. Quick chapters with exercises to gain better understanding and help you reconnect to yourself and become whole, peaceful and fulfilled.